Welcome to Town Square, McCaleb Homes newest historically-inspired community. Winding roads, a beautiful pond and wooded home sites allow you to step into a simpler, more relaxed season of life. 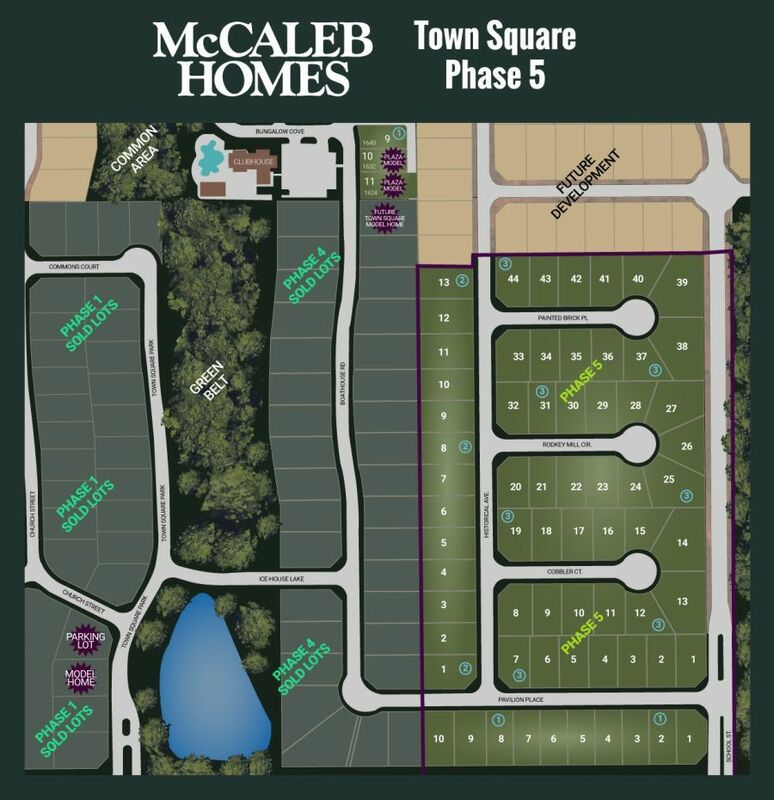 Town Square, McCaleb Homes’ featured community with its winding roads, beautiful pond, and wooded home sites - is currently in its 5th phase of construction. The 5th Phase of Town Square is now open for lot reservations and contracts to start building. Over 100 homes have been built since 2014 in this Edmond OK community featuring a family friendly environment and historically inspired homes. Located on Danforth between Sooner and Coltrane, Town Square provides easy access to I-35, Kilpatrick Turnpike and downtown Edmond and a quick drive to Oklahoma City. Enjoy Edmond’s Award winning schools such as Northern Hills Elementary, Central Middle School, and Memorial High School. Town Square is conveniently located to every need and want, for day-to-day living. Less than a mile from movie theaters, golf courses, grocery stores, and restaurants you can shop and enjoy entertainment in just a few minutes. Homeowners in Town Square are able to take advantage of the fishing dock and walking trails around Ice House Lake. Enjoy the views of the big fountain in the center of the lake, or take out a community paddle boat for some outdoor recreation on the water. You will love our brand new Town Square Residents Club! This complex features 7,000 feet of indoor space. It houses a fitness center with state-of-the-art work-out equipment, full fitness studio to hold classes, weightlifting, and aerobic machines. The clubhouse consists of a great room, kitchen, and outdoor living and cooking spaces for community bar-b-ques and entertaining. Townie Recreation Center features a gaming area, pool table, ping-pong, and televisions to keep the teens occupied and active. Town Square features many vintage bungalow collections such as the Craftsman, English Tudor, Modern Farmhouse, and Spanish Mission style homes. Each home site is unique whether it is wooded, backs up to the woods or provides a view of the lake. Reservations available for Phase 5 homesites in Town Square. If you’re ready for a visit to Town Square, and would like to tour our model, our Online Sales Counselor, Kylie would love to help provide you with more information and set up a VIP tour for you. Open 7 Days a week: Appointments recommended. Email kylie@mccalebhomes.com or call 405-315-1383 to set up your VIP appointment! Located in our newest community, Town Square, this beautiful home is equipped with high-end custom woodwork, hardwood flooring and many other luxury design touches.